New Improved Larger Unit and Design - Over 4,500 mg of ozone production and a new larger fan produces more ozone and sterilizes more square footage for the same price. Compare to other generic square ozone generators on the market and our larger fan, better timer unit, and proprietary ozone plates distribute more ozone more efficiently at a lower cost. Get more odor elimination for less money! Now that's value! Don't let your lungs be the ONLY air purifier in your home! This industrial grade ozone generator/air purifier does not merely mask mal odors like some air purifiers, it DESTROYS odors! Utilizing activated oxygen (O3) technology, the Enerzen air purifier/ozone generator oxidizes and destroys airborne contaminants such as bacteria, viruses, and odors. The oxidation process breaks down the molecular structure of bacteria, viruses, and bad odors, thereby neutralizing them. What is left is a "fresh, clean spring rain smell" similar to the clean air smell after a rain storm (nature's ozone generator). Over 4500 mg/hr of ozone produced kills germs, deodorizes, and freshens the air. Power: 55W, 110V AC. Timer Function. Size: 8.75"(H) x 10"(W) x 7.75"(D). Satisfaction guaranteed: 30 days unconditional replacement or refund if you are not satisfied. Factory Warranty: 1 year. CE certified and approved (HBSC2013012307)! THE ENERZEN OZONE GENERATOR IS BIGGER AND BETTER THAN THE OTHERS -- Compare our unit with the other generic box units on the market and you will see that our fan is larger for better ozone distribution, our ozone plates generate more ozone, and our industrial design is sturdier. POWERFUL ODOR ELIMINATION AND MOLD CONTROL AND REMOVAL -- Eliminates virtually ANY mal-odors from mold, cigarette/cigar smoke, pet odors, paint/cleaning fumes, dust, water damage, smoke damage, cooking odors, and other airborne irritants. Helps to eliminate and retard mold, mildew, and fungus growth. COST AND ECO-FRIENDLY DESIGN - Ultra-low energy usage yields cost and energy savings. Industrial grade steel casing will keep this purifier cleaning for years to come. USA 110V ONLY Model. STURDY INDUSTRIAL TIMER FUNCTION -- Our improved timer is sturdier than others and allows you to control the length of purification time. 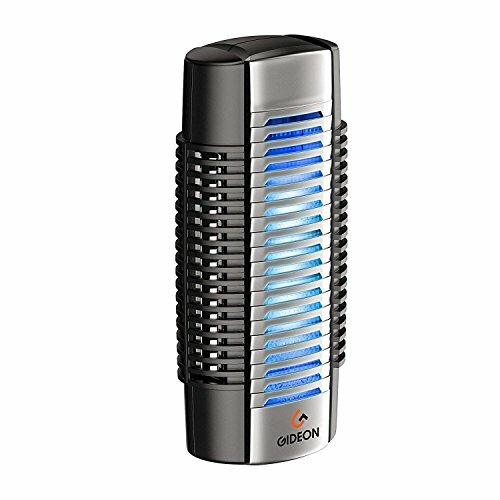 The Gideon Electronic Plug-in Air Purifier is the easy and safe way to eliminate germs, odors and allergens such as dust mites and mold spores. Just plug into any outlet, and enjoy the crisp and clean air. The powerful air purifier ultraviolet light kills over 98% of airborne germs, the Ionic purifier freshens the air, while the whisper-quiet fan helps circulates the air. Great for bathroom, kitchen, pet area, baby nursery, etc. Ideal use in an area of up to 150 sq. ft. The Gideon Electronic Plug-in Air Purifier and air cleaner comes fully assembled; with the UV bulb and stainless steel filters fully installed and ready to use right of the box. Simply plug in the device and immediately enjoy the crisp and clean air. Looking for a way to hide that smell?! 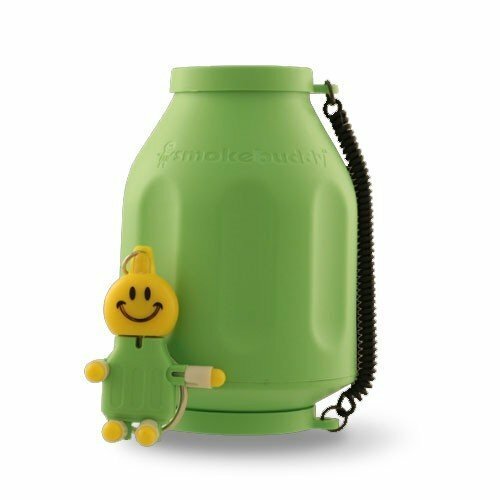 The Smokebuddy (Lime) is a smaller pocket size, life saving air filter. Allows you to simply exhale your smoke through the Smokebuddy and odorless air comes out the other end, keeping secondhand smoke away from your loved ones. Environmentally friendly. Compact and convenient. Keeps secondhand smoke away from those you love. Allows you to smoke where you want, when you want without anyone knowing. Removes odor and smoke from air like magic. Includes a Smoke Buddy Keychain with LED light. Travel Caps Included for storing discreetly. Estimated roughly 300 uses or more. WARNING: This product can expose you to chemicals which is [are] known to the State of California to cause cancer and birth defects or other reproductive harm. For more information go to www.P65Warnings.ca.gov. New Improved Larger Unit and Design - Over 5,000 mg of ozone production and a new larger fan produces more ozone and sterilizes more square footage for the same price. Compare to other generic square ozone generators on the market and our larger fan, better timer unit, and proprietary ozone plates distribute more ozone more efficiently at a lower cost. Get more odor elimination for less money! Now that's value! Don't let your lungs be the ONLY air purifier in your home! This industrial grade ozone generator/air purifier does not merely mask mal odors like some air purifiers, it DESTROYS odors! Utilizing activated oxygen (O3) technology, the Mammoth air purifier/ozone generator oxidizes and destroys airborne contaminants such as bacteria, viruses, and odors. The oxidation process breaks down the molecular structure of bacteria, viruses, and bad odors, thereby neutralizing them. What is left is a "fresh, clean spring rain smell" similar to the clean air smell after a rain storm (nature's ozone generator). Over 4000 mg/hr of ozone produced kills germs, deodorizes, and freshens the air. Power: 55W, 110V AC. Timer Function. Size: 8.75"(H) x 10"(W) x 7.75"(D). Satisfaction guaranteed: 30 days unconditional replacement or refund if you are not satisfied. Factory Warranty: 1 year. NEW 5000mg OZONE GENERATOR-- Portable, compact & powerful ozone generator that deodorize and sterilizes the air. About Airthereal: A Real Room, An Ethereal Ambiance In order to protect your health, Airthereal was established in 2017 to improve indoor air quality around the world. Since then, we have been fighting against a multitude of health hazards that are present in the air we breath, such as: chemicals, smoke, allergens, etc. Our mission at Airthereal is to keep your family healthy and happy. Airthereal stays at the forefront of air purification innovation in order to constantly improve our products and your experience. HIGH CAPACITY 10,000 mg/h: Upgraded MA10K-PRO ozone plates support high ozone output of 10,000 mg/h with 5-year or 20,000-hour service life. REMOVE TOUGH ODORS: A must-have for large rooms, offices, hotels, restaurants, farms, labs, pet zones, basements, garages, vessels, hospitals, schools and kindergartens, water and fire damaged areas, etc. EASY OPERATION: Apply the ozone treatment twice a week for normal use. You can increase the treatment duration and frequency when air problem recurring. 120MIN TIMER FOR SAFETY CONCERNS: All ozone machines all for UNOCCUPIED space only. Set a timer before you leave the room. Ensure that no people (and also pets) in the room when it's working. Return to the room when all residual ozone reverts back to oxygen, which costs normally 30 minutes. WARRANTY & MAINTENANCE: We provide 3 years warranty. For any questions or unsatisfactory, please contact us at support@airthereal.com. We will address your issue as soon as we can. Warranty: We provide 3 years warranty from date to purchase. Achieve the cleanest refrigerator possible by purchasing just one pureAir FRIDGE! Sanitize the air and surfaces in your fridge better than baking soda or anything else on the market! Completely kill all odors in the fridge so that every time you open your refrigerator door you are amazed by the fresh smells, fresh food, an overwhelming sense of cleanness. Designed and sold by an American-owned company in East Tennesee. Don't be fooled by Chinese knock-offs that won't last and do not work as well. pureAir FRIDGE is guaranteed to last! pureAir FRIDGE purifies and sanitizes the air and surfaces inside your refrigerator, allowing a healthier, fresher environment for your fresh fruits and vegetables. Using ionization and ozone technology, pureAir FRIDGE destroys bacteria such as E-coli and Staphylococcus and neutralizes pesticides. Produce stays fresher longer because pureAir FRIDGE reduces ethylene gas from decaying food. Foul food odors are eliminated and your fridge will smell fresh every time you open the door. Powered by a lithium-ion battery and equipped with photosensor technology, pureAir FRIDGE intelligently displays a battery life notification LED light and activates a pleasant audible alarm only when the fridge door is opened. pureAir FRIDGE is simple to maintain and clean, and charges in less than 4 hours to purify your fridge for 18-24 days on one charge. Store pureAir FRIDGE anywhere in your fridge thanks to its compact design and enjoy a fresher fridge and fresher food. GreenTech Environmental innovates, develops, and manufactures high-quality electronic products that positively impact everyday the lives and health of people throughout the world - all while protecting the environment. Everything we do makes a difference. GreenTech Environmental stands for newest technologies created, distributed, and supported by an extraordinary group of people committed to providing you, our customers and consumers, lifelong service that amazes. EXTENDS THE LIFE OF YOUR FOOD: Food stays fresher longer when kept in an environment free of bacteria, mold, and gasses. DESTROYS FOUL FRIDGE ODORS: Experience freshness every time you open your fridge door. pureAir FRIDGE eliminates odors caused by food decay. KILLS E-COLI, STAPH, AND OTHER BACTERIA: Ionization and ozone quickly and consistently destroy bacteria and contamination in your fridge and food storage. RECHARGEABLE LONG-LASTING BATTERY: Lithium ion battery lasts 18-24 days and recharges easily overnight. DESIGNED AND SOLD BY TENNESSEE FAMILY-OWNED MANUFACTURER: Our family business is available to you for all customer service and support needs. 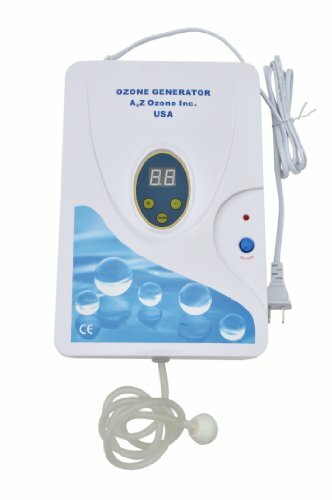 Ozone Generator air purifier to eliminate smoke smell, cigarette odor and general odor eliminator. Best air fresheners for the home and help kill mold and mildew spores. Portable air purifier. 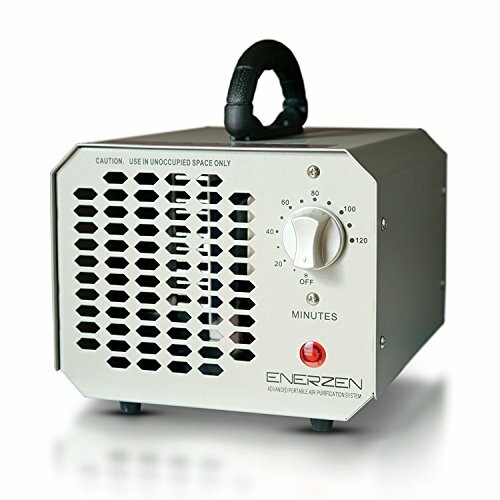 The Only Ozone Generator with a 30 minute timer!! The Personal Ionizer Ozone Generator Has The Latest Fan Technology! Lasts longer Quieter than the competition Pushes ozone efficiently Don't compromise your health! Stop using harsh, chemical sprays or wasting money expensive filters in subpar air purifiers that are ineffective in removing odors. And don't forget most of them are noisy and hard to fall asleep when on. 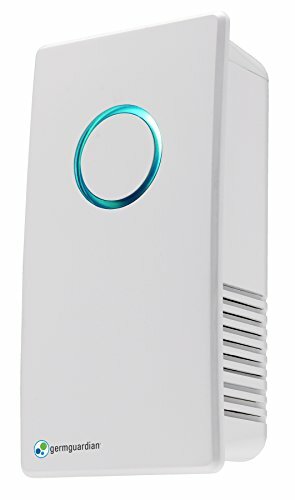 The One Earth Health Ozone Ionizer is an advanced and proven small space plug-in air purifier that puts you in control of the indoor air purification level by featuring an adjustable control knob that allows you to customize its purification power. The Ozone ionizer uses the scientifically verified power of activated oxygen (ozone), in conjunction with negative ionization, to destroy MRSA, E-coli, Legionella, Candida, Staph, Giardia and Salmonella better than filters or chemical disinfectants. It kills E-coli more than 3,000 times faster than chlorine and even kills mold and mildew in bathrooms. But don't forget the germs lurking in carpets, drapes, furniture, under beds, in closets, on countertop surfaces, in crevices, and other places not normally exposed. Small and Effective, You Can Use It Anywhere! The One Earth Health Ozone Ionizer is ideal for bathrooms, laundry rooms, work stations, garbage facilities, offices, locker rooms, janitorial closets, kitchens or even hotel rooms! Lightweight and compact and it fits easily into the palm of your hand, the device consumes less power than a light bulb. And it covers up to 330 square feet! This small ozone generator pack a punch! Never buy another air purifier again! AIR SCRUBBER: Get rid of musty smells and kill mold spores. Great air purifier for smokers. LIFETIME WARRANTY: This smoke eater, odor remover with whisper quiet fan will do the job. SMALL AND POWERFUL: Portable generator for home use, car and pets can be used anywhere. SAFETY: Run it when the room is empty. Coverage up to 330 Sq. ft. Ozone has distinct smell. This Revolutionary Plant Air Purifier quietly emits 8,000,000 pcs/cm3 negative ions into the air. According to the source published by KOREA Far Infrared Association KIFA, most of the Nature Forest and Waterfall's negative ions concentration is about 50,000 pcs/cm3 . Negative ions, which exist in Nature forests, waterfalls, seashores in high concentration, have positive effects on human's physical and mental health. Breathing in negative ions promote relaxation and have been reported to normalize human's breathing rate, decrease blood pressure and relieve tension! How it works? When oxygen in the air is charged by the ionizer, negative ions are generated. Negative ions bind with the airborne pollutant such as positively charged smoke, dust, pollen, germs, bacteria, PM 2.5 and a process called " Charge Neutralization " occurs. The air pollutant was removed and killed and it will naturally subside to the ground instead of being inhaled into human's lung. This air ionizer can remove 99.97% of air impurities such as smoke, dust, germs, pollen, smell. Our lab experiment shows that this air purifier can effectively remove thick injection of smoke in an air tight container in less than 20 secs! Helps to Relieve Allergies Symptom.. This air purifier is great to have for those who suffer from airborne particles allergies such as flu, sinus, asthma and eczema. It's also perfect for health conscious people who would like to improve their overall health and to have better wellness for themselves and family. A Lovely Evergreen Plant.. 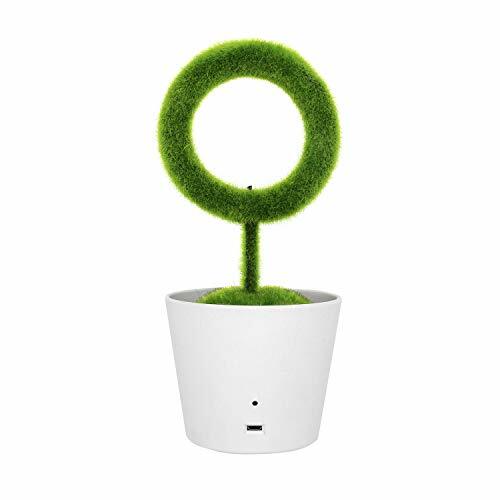 This is not only an air purifier but also a lovely plant made of evergreen grass to bring some greenery to your space such as office & home. - This Air Ionizer can produce 8,000,000 pcs/cm3 negative ions into the air where most Nature Forest and Waterfall negative ion concentration is about 50,000 pcs/cm3 according to the source published by KOREA Far Infrared Association KIFA. 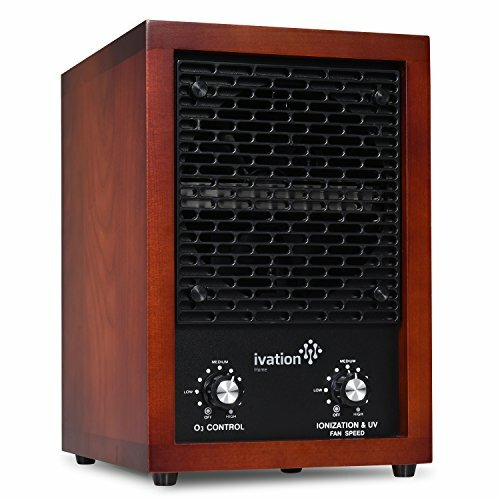 This air purifier is simple & hassle free with only one operation button, purification range up to 100 sq ft.
- When oxygen in the air is charged by the ionizer, negative ions are generated. Negative ions bind with the airborne pollutant such as positively charged smoke, dust, pollen, germs, bacteria, PM 2.5 and charge neutralization occurs. The air pollutant was removed, killed & absorbed by the negative ions and subside naturally to the ground instead of being inhaled into human's lung. - Negative ions, which exist in waterfalls, forests, seashores in high concentration, has many positive effects on human's physical & mental health. Breathing in negative ions have a relaxing effect and have been reported to normalize your breathing rate, decrease blood pressure and relieve tension. - This product is CE, RoHS, FCC Compliant. If for any reason you're unhappy with our Plant Air Purifier, we'll provide a full refund with no questions asked. Please feel free to contact us if you have any issues, we will do our best to help you. The Aqua-6, a 600 mg/hour multipurpose ozone generator, is a versatile unit that can provide the benefits of ozone in every room of your home for simple air and water ozonation. 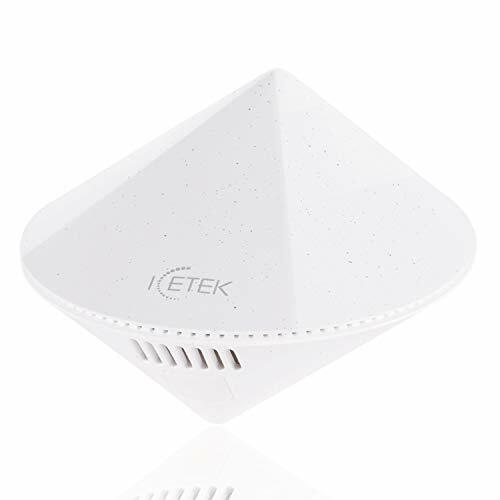 Automatically removes 99.97 percent of allergens and pollutants as small as 0.3 microns from your home including pollen, bacteria and pet dander. 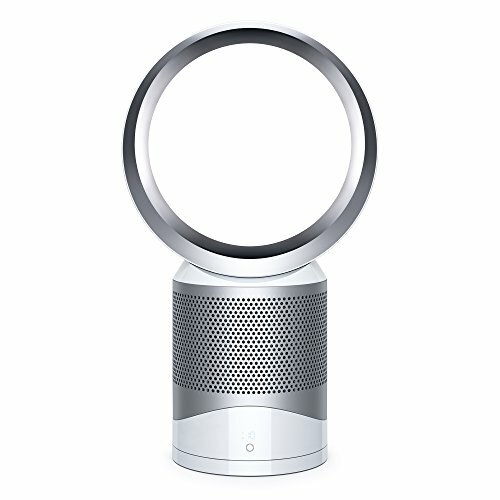 The Dyson pure cool link purifier fan is wrapped with a 360 degree 2nd generation Dyson HEPA filter. A layer of activated carbon granules captures odors and harmful toxins like paint fumes. Purification all year round. Purifying fan in summer. Year-round purification and circulation. Smooth, long-range air flow to cool you in summer. Intelligent purification automatically monitors, reacts and purifies - then reports to your Dyson link app. So you can remotely control your environment. Also features a night-time auto mode that monitors, reacts and purifies, but only using the quietest settings. LED display Dims - no disturbance. Easy filter change - instead of washing a filter every month, just Replace it after a year of using it for 12 hours every day. Dyson pure cool replacement filters 2 year warranty on parts and labor. Excludes additional filter. Instead of wasting money and space on multiple professional air filtration devices, ours incorporates all of today's most popular purifying treatments in one simple machine. Combat odors, eradicate dust, sanitize air, prevent allergic reactions and disperse a delightfully 'clean' scent throughout any space up to 3,700 square feet. When ultraviolet radiation and oxygen come into contact, a chemical reaction occurs, creating a refreshing atmospheric effect like after a thunderstorm. 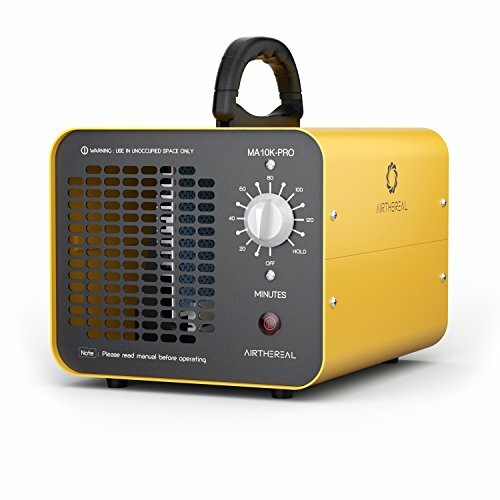 Replicating the same electrical arcing in an indoor environment, this ozone generator causes molecules to bind to airborne particles, thereby neutralizing odors and lifting mood. Similar to waterfalls, lightning, ocean waves and other natural phenomena, ionization improves ambiance while targeting dust, mold spores, tobacco odors and similar pollutants. With fewer irritants in their midst, individuals experience fresher, cleaner, safer breathing all day long. Area covered: weed odor eliminator pot Up to 3700 sq. ft. Negative ions perform this function by attaching themselves to positively charged particles in large numbers and negatively charging those particles. As a result, these viruses, bacteria and pollen and spores become too heavy to remain airborne and are thus prevented from entering your breathing passage where they can make you fall sick. In other words, negative ions form a protective circle around you. Particulate matter 2.5 (PM2.5), refers to tiny particles or droplets in the air that are two and one half microns or less in width. Negative ions are abundant in nature, especially around waterfalls, on the ocean surf, at the beach and after a storm. The most important benefit of negative ions is that they clear the air of airborne allergens such as pollen, mold spores, bacteria and viruses. They also clear the air of dust, pet dander and cigarette smoke. They're really good at cutting down the airborne infection rate. 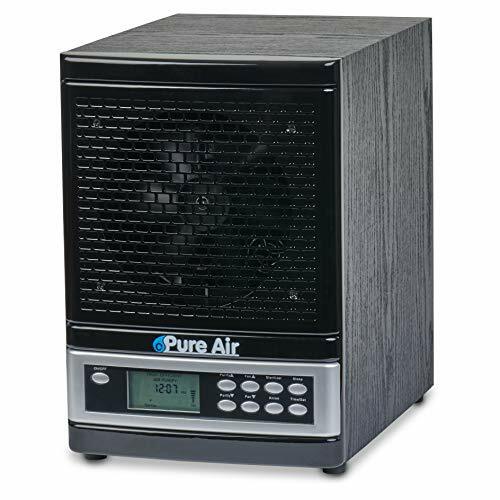 Whether you are a healthy person, or someone who may have respiratory issues such as asthma or allergies, you may be considering purchasing this air purifier to reap the many health benefits of better indoor air quality. How small is 2.5 micrometers? The average human hair is about 70 micrometers in diameter, making it 30 times larger than the largest fine particle. Desktop air purifier. Ozone generator.Produces 8 Million pcs/cm3 Negative Ion for 100 square feet. Maintenance free. No filter. No watering. Quiet, Ease to use via USB charger port USB cord Included. Negative ions attach themselves to positively charged particles. Negatively charging those particles. Refresh and personalize your space, artificial grass. Home decor, office,bedroom living room. 100% Money Back - Try it, love it or your money back with no questions asked. More Ozone means you have the ability to treat larger spaces more effectively, and smaller spaces more rapidly. With the dual level control you can rest easy knowing you have the right tool for any job. This industrial grade ozone generator/air purifier does not merely mask mal odors like some air purifiers, it DESTROYS odors! 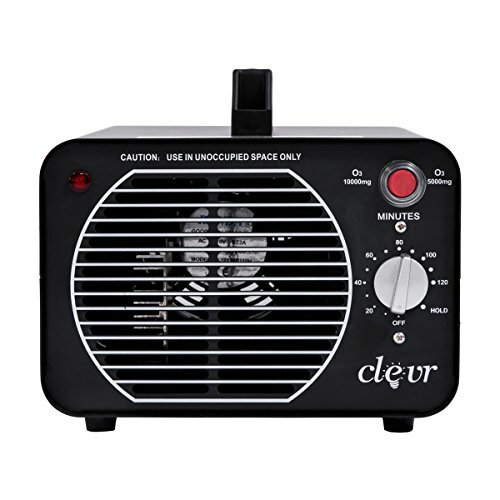 Utilizing activated oxygen (O3) technology, the Clevr air purifier/ozone generator oxidizes and destroys airborne contaminants such as bacteria, viruses, and odors. The oxidation process breaks down the molecular structure of bacteria, viruses, and bad odors, thereby neutralizing them. What is left is a "fresh, clean spring rain smell" similar to the clean air smell after a rain storm (nature's ozone generator). 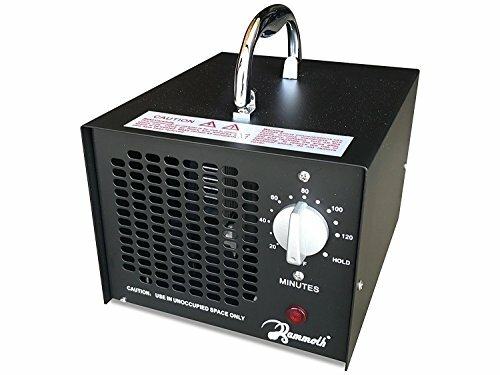 Not just powerful ozone output that makes it kill germs, deodorizes, and freshens the air, this dual mode ozone generator has the unique design for easy ozone plates replacement. This reduces hussle of maintance, and it comes with a washable pre filter. COMMERCIAL GRADE: Heavy duty construction. Easy maintenance. Covers up to 8000SQFT, specially designed for extra large commercial or industrial use. COST and ECO-FRIENDLY: Ultra-low energy usage yields cost and energy savings. Industrial grade steel casing. Portable Design. NOTE: Ship From INDIANA, we do NOT ship and sell to California customers due to the state regulations. ALL ozone generators should only be USED IN UNOCCUPIED SPACES (including pets). 2. Please try to use the product in relatively lower temperature environment. Higher temperature ozone will accelerate the conversion into oxygen. When the temperature exceeds 30 /80 , the amount of ozone will be reduced by half after one minute. If it exceeds 50 /122 , ozone will be converted into oxygen immediately. 2019 Upgraded, Deer Hunting Odor Elimination Designed specifically for avid whitetail, Mule Deer, elk, bear and predator hunters where scent control is key. Portable & USB Rechargable Provides several days run time and over 500 recharges, Applicable area up to 70cu ft, 2cu metre. Ozone output: 2mg/h. 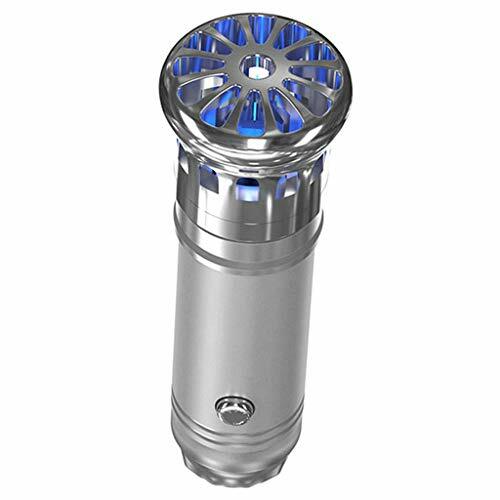 Air Purifier & Sterilizer Compact yet powerful ozone generator designed to eliminate odors from hunting clothing & gear including body odor, sweat, bacteria, chemicals, and smoke. Humanized Operation One-button Operation is a simple and effective means to protect your gear from contamination, ensuring your gear is always scent-free ready when you hit the Woods. More Powerful Odor Elimination This odor eliminator can help you to eliminate any invisible bacterial (smell of smoke, pet stool, paint, plastic, silica gel etc) : hunting gear bags, car, pet house, shoe closets, shoes, drawer, cabinets, wardrobes, travelling cases, etc. 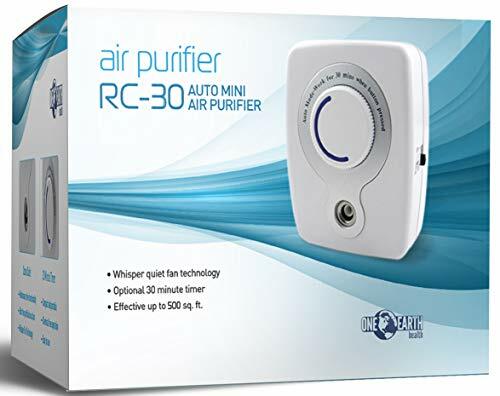 - Function: Captures common airborne pollutants such as allergens, odors, smoke, mold spores, dust mites and pet dander. - Application: Suitable for car, bedroom and office to purify air. You can put it on the floor or on your desk. - Design: Unique size and contemporary design makes it a perfect fit in smaller room or office space. - Quality: Premium motor ensures low consumption, long lifespan, fast blow speed and low noise. - Convenient: Compact, exquisite and stylish, movable design, you can take it at any time to anywhere. * Design: Unique size and contemporary design makes it a perfect fit in smaller room or office space. * Application: Suitable for car, bedroom and office to purify air. You can put it on the floor or on your desk. 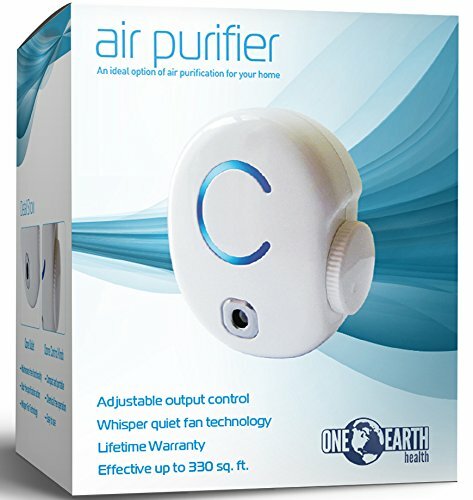 * Function: Captures common airborne pollutants such as allergens, odors, smoke, mold spores, dust mites and pet dander. * Quality: Premium motor ensures low consumption, long lifespan, fast blow speed and low noise. * Convenient: Compact, exquisite and stylish, movable design, you can take it at any time to anywhere. Please be careful when you use the eyebrow razor! Bend the handle to allow you to trim your eyebrows easily. Easier on you and your skin with less pain and less redness. 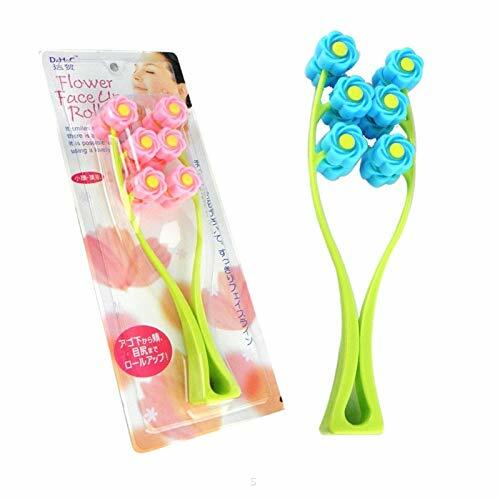 These eyebrow razor are perfect for removing other fine hair anywhere on your face and for trimming around your bikini area. 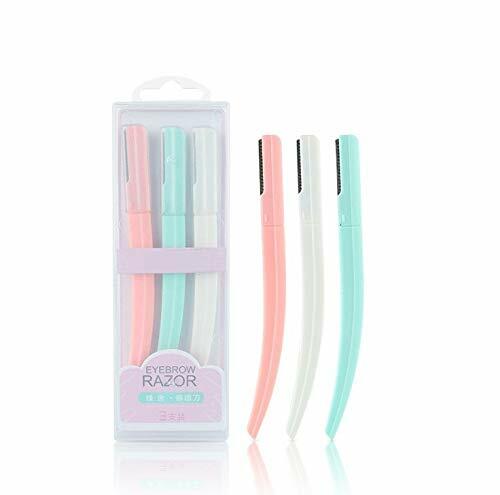 These eyebrow razors feature precision-engineered stainless steel for lasting sharpness, and gracefully curved handles for control and accuracy. Lightweight and non-slip grip for easy control. Hold at a 45 degree angle to your skin and take short strokes in the direction of the hair growth and voila! skin is as clean as a baby's bottom. Nature is the ultimate purification system and nothing cleans the air as well as a naturally-occurring thunderstorm - until now. By using technology specifically developed to work like a thunderstorm, the O3 PURE has become one of the most advanced air purification devices on the market. Years of research and testing have gone into the development of the O3 PURE in order to create an air purifier that stands alone in superiority. 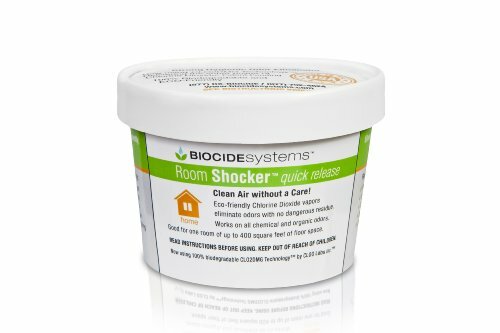 In a matter of minutes, it can eliminate unpleasant smells, fumes, toxins, particles, or mold in any area of your home (up to 4,000 square feet). By utilizing 8 methods of purification, you could work to alleviate your allergies that are caused by bacteria, smoke odors, mold, mildew, and dust, just as the Earth naturally does with a thunderstorm. Think back to the invigorating air you've taken in after a thunderstorm. How would you like to experience that feeling every day in your own home? Try the O3 PURE today and experience true purifying power. Added features include a cleanable HEPA Filtration System, Photo Catalytic Oxidizer and additional Catalytic Filter, Activated Charcoal Filter, Prefilter, positive ion, safe oxidizer and hydro-peroxide generation, fixed 6.5 DC needle ion generator, replaceable purification plates. 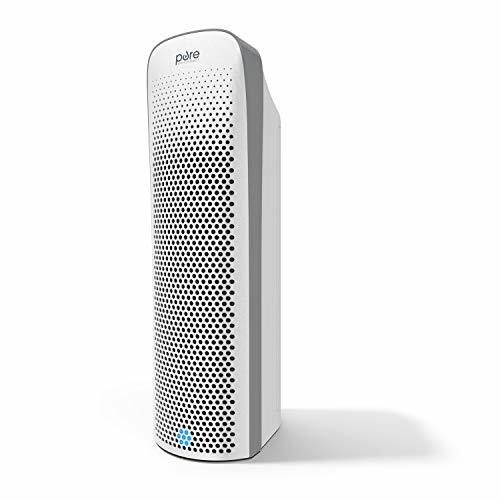 POWERFUL AND COMPACT - The O3 PURE Whole Home Purifier freshens air and removes dust, pollen, smoke, cooking smells, pet odors and other airborne contaminants. 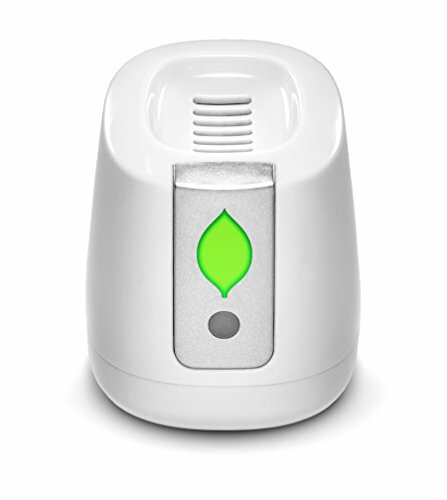 The unit also attacks contaminants both in the air and on surfaces in the home or office. The unit is perfect for tasks ranging from simple air purification to to filtering a wide range of particulates. 8 STEP AIR TREATMENT - In addition to an on board ozonator, negative ion generator, UV and PCO the unit comes with a 4-stage filtration system. Dust filter to trap large debris. Activated charcoal filter to remove smells and odors. True HEPA filter to capture the smallest airborne particulates. PCO filter to passively break down complex chemicals. FULLY ADJUSTABLE OZONE GENERATOR - The unit contains a powerful ozonator that can be adjusted or turned off. The unit is a perfect solution wherever smells from mold, mildew, smoke and other unpleasant odors are a problem. The ozone will actively remove these smells and convert back into regular oxygen. If the ozone plates are ever damaged, they are fully replaceable. NEGATIVE ION, UV and PCO FUNCTIONS - Fixed 6.5KV DC needle ion generator creates charged particles to remove dust, dander, mold spores, pollen and other indoor allergens and pollutants. Equipped with dual UV (ultra violet) lights. The UV lights work with the PCO (Photo Catalytic Oxidizer) filter to passively break down complex chemicals in the air. EASY TO INSTALL OPERATE AND MAINTAIN - Unit features a real wood exterior, removable front grill for easy cleaning and is ready to operate right out of the box. Low power usage of only 50W. Includes a spare backup fuse. All Stainless-Steel interior hardware, with sealed plug in connectors. Unit is fully serviceable and all part components are available at the manufacturer's website. Backed by a 2 Year Manufacturer Warranty with over 15 years experience in air and water purification. Warranty: 2 year manufacturer warranty.